QUEENS — The deadly hurricanes striking the U.S. and the Caribbean have changed the migratory patterns of birds, bringing unique species and migrating birds seeking temporary shelter to the New York City area, local birdwatchers said. Some birds, experts said, end up in the area because they are carried by storms or are trying to run away from them, while others land here because they are disoriented. “It’s exciting for birdwatchers but it’s not great for the birds,” said New York City Audubon naturalist and guide Gabriel Willow. Every hurricane is different, Willow said, and their effects on birds vary, depending on their specific path and strength. Hurricane Irene, for example, which hit the New York area in August 2011, was especially "generous" to local birdwatchers, bringing species like tropicbirds and storm petrels, typically found in the Caribbean, Willow said. But because both species are seabirds, designed to eat seafood and soar over the ocean, flying up to such remote territories, sometimes inland, may be deadly for them, Willow said. “Hopefully some of these birds will find their way back," he said. Willow said that while he hasn't seen that many birds specifically trying to escape hurricanes this year, he has spotted a few that are rare for the area. 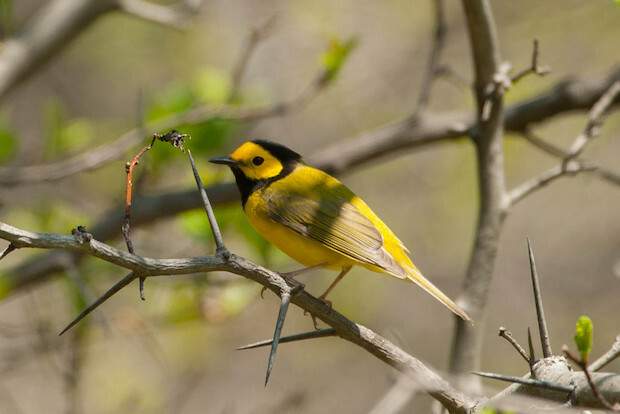 Earlier this week, however, he spotted a Western kingbird — usually found in western North America — on Governors Island. There were also reports of a sooty tern — which usually nests on remote islands in the South — on Staten Island. A roseate spoonbill, commonly found in warmer climates, was also recently spotted in Cumberland County, in New Jersey, according to a published report. Those interested in spotting seabirds and coming to New York because of the storms should keep their eye on coastal areas, Willow said. “I think it’s worth going to the southern tip of Staten Island, out to Coney Island or Jones Beach and scanning the ocean when a storm arrives or right after it passes,” he said. But tropical storms and hurricanes, such as Maria, which just hurtled through the Caribbean, also affect birds currently migrating south for the winter, which seem to currently linger in the New York area, he said. “I think a lot of birds have been waiting for the storms to pass,” he said, adding that they also often wait for favorable winds. "They want a tailwind, not a headwind," he said. Birdwatchers throughout the city can spot dozens of species these upcoming days, he said, including various warblers, tanagers, thrashers, vireos, flycatchers, grosbeaks and orioles. All big parks in the city are great for birdwatching, he said, from Forest Park in Queens, Central Park in Manhattan and Prospect Park in Brooklyn to Van Cortlandt Park in the Bronx and Clove Lakes Park in Staten Island.